I can’t say no to Italian food. Dipping warm bread in oil. The al-dente handmade noodles. Luscious red wine. The scent of sauteed garlic with onions. Anything with balsamic vinegar. I’m a sucker for all of it and completely embrace my Itali-obsession. 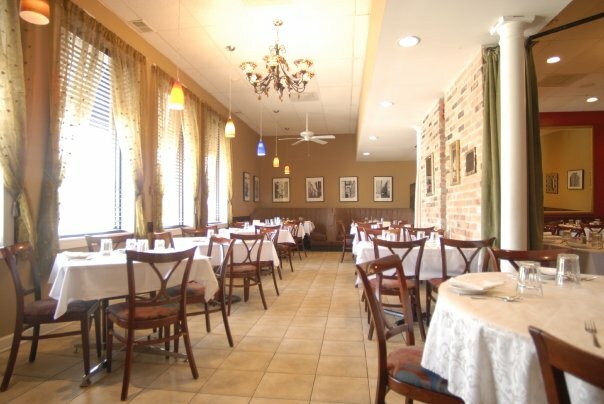 So, you probably can understand my excitement when I was invited to try a local family-owned restaurant in the Lincolnwood neighborhood of Chicago (not too far from where I went to high school) called Via Veneto. Chef Tony Barbanente has been cooking at this restaurant for 20 (!!!) years, a fact I couldn’t get off my mind throughout our whole meal. From each dish that appeared at our table it was evident Chef Tony not only is passionate and loving with his cooking, but he’s extremely proud of each individual plate he sends out. G and I took up shop in the coziest of booths with a full, expanded view of the dining room. We toasted our glasses of a bottle of Barbara d’Alba, one of my absolute favorite red wines and dipped warm, homemade bread in olive oil, vinegar, black pepper & parmesan. Big props to our waiter who left the parmesan on the table – he must have subconsciously known I’d be using it for later. But seriously – waiters – don’t sprinkle parmesan on a guest’s plate & then take it back. If we asked for it, we want it. All of it. All of the cheese! 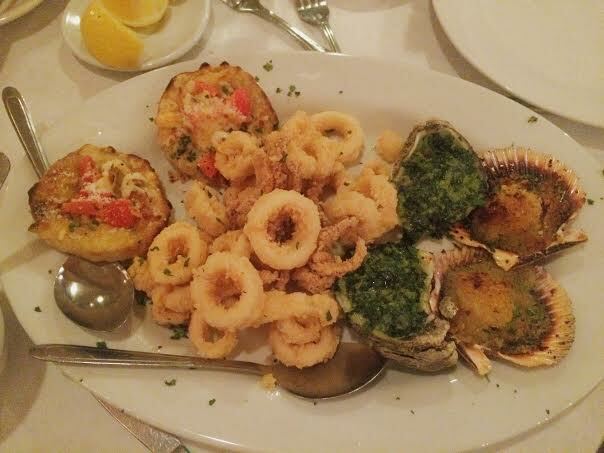 Via Veneto is known for their fresh seafood, so we were treated to a speciality appetizer plate filled with four popular items: oysters baked in pesto, garlic and breadcrumb’d sea scallops, lemony calamari and the best tasty fried eggplant with mozzarella & roasted peppers. To say it was a tasty little start would be an understatement. Next up was the pasta. Now, please don’t curse me, but I didn’t snap a photo of this dish, so you’ll have to let my explanation do the talking. When I spotted the giant bowl full of spaghetti topped with shrimp across the dining room, I knew exactly dish was headed our way. I had browsed the menu beforehand and these particular flavors caught my eye: lemon spaghetti, artichokes, shrimp, fresh tomatoes, garlic & oil puree. Let’s just say, we cleared our plate in minutes. The pasta was perfectly al-dente and handmade. The shrimp was spiced and generously coated in the garlicky puree. Artichokes were tender and flavorful and the tomatoes were bursting with their juices. I happily slurped up every last bite, nodding in contentment with G – this dish really was fantastic. Plates cleared – we were definitely getting full. But, as any good Italian knows, the pasta is just a precursor to the main dish. A palate cleanser. A light appetizer. The calm before the (steak) storm. Yep. This happened. 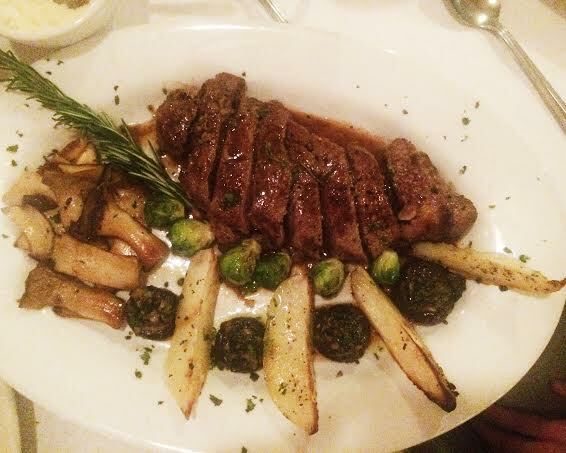 A perfectly medium-rare, juicy hunk of meat served with roasted brussels, roasted potatoes and the most buttery, tender, heaven-sent mushrooms I’ve ever had the pleasure of tasting. When it comes to steak, there shouldn’t be any bells & whistles. Let the flavors shine, with plenty of seasonings. Chef Tony, you nailed it. I’m still thinking about those mushrooms and I don’t really like mushrooms to begin with. As my Itali-obsessed self, I beamed when Chef made his way over to the table and we were able to chat for a few minutes. We talked about his family and where they’re from in Italy – the Mola di Bari region on the S.E. coast and my family, from both Calabria in S. Italy and Rome. We discussed the history of the restaurant, the techniques of the dishes and of course, the ‘shrooms. As they’re only available in-season, it was a real treat to experience such a wonderful delicacy. While browsing the dessert menu, we promised ourselves no sweets. We were simply too full. But of course, I convinced G to end with the tiramisu. “It’s light…you’ll like it,” I promised him. 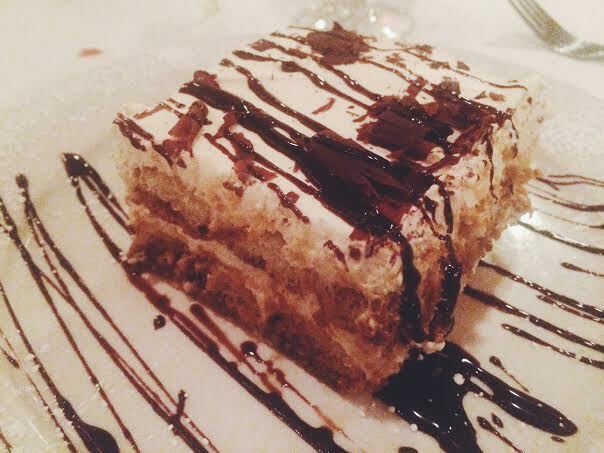 Fluffy, chocolatey and *exceptionally* light, Chef Tony’s handmade tiramisu was a wonderful ending to a special meal. Thank you so much to the gracious team at Via Veneto & Chef Tony for treating us to such a great evening. I can’t wait to come back! Via Veneto: 6340 N. Lincoln, 773.267.0888.